Chrystia Freeland says the clause is no big deal. 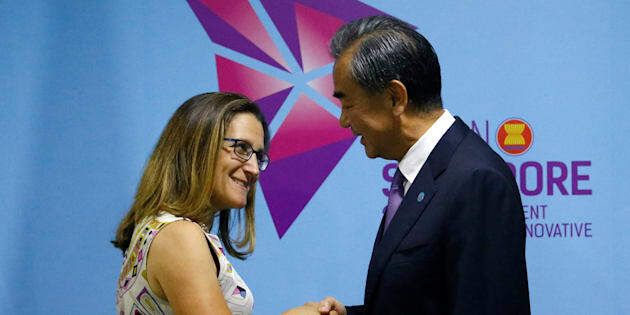 Foreign Minister Chrystia Freeland and China's foreign minister, Wang Yi, shake hands during a bilateral meeting on the sidelines of the ASEAN Foreign Ministers' Meeting in Singapore, Aug. 3, 2018. Canada's new trade agreement with U.S. and Mexico contains one clause that could have a big impact on national sovereignty and puts the agreement itself at risk in the long run. Inside the United States-Mexico-Canada Agreement (USMCA) is a provision that allows any member country to essentially veto free trade agreements with non-member countries by dissolving the USMCA to form a bilateral agreement instead. Though the text doesn't mention China by name, observers agree that the country is the principal target. Watch: Scheer says Justin Trudeau 'backed down to Donald Trump' on USMCA. Story continues below. According to Article 32.10 of the agreement, any country in the agreement must inform the other two if it intends to start free trade negotiations with a "non-market" country, and must allow them to review the full text of the agreement. The clause says that if the other countries review a potential trade agreement and decide it will impact trade among them, they can terminate the trilateral USMCA with six months' notice and replace it with a bilateral agreement. Though any country has the power to utilize this clause, it's unlikely Canada would invoke it against the U.S., its largest trading partner and biggest buyer of its exports. How does this impact Canadian free trade with China? A "non-market country" in this case is one that either Canada, Mexico, or the U.S. does not have a free trade agreement with, and has been determined to have a non-market economy. According to U.S. legal definitions, a non-market economy is one that "does not operate on market principles of cost or pricing structures, so that sales of merchandise in such country do not reflect the fair value of the merchandise." Experts like Hugh Stephens, a distinguished fellow at the Asia Pacific Foundation of Canada, have said the clause is specifically aimed at China. Stephens, a distinguished fellow at the Asia Pacific Foundation of Canada, called the clause "unprecedented in any trade agreement that any other country has ever signed." He said he suspects the clause was introduced as a "poison pill" at the last minute, and Canada agreed to it "because we had a gun to our head." "Normally there would've been some reference to it, a leak, or at least some consultation with the Canadian business community who are very interested in doing a deal with China," he said. President Donald Trump has accused China of unfair development tactics, including "stealing or pressuring foreign companies to hand over technology," which American officials view as a threat to U.S. industrial leadership. Trump has declared an all-out trade war on China with billions of dollars in tariffs, which Beijing has described as "the biggest trade war in economic history." The U.S.-China strife is also rooted in longstanding conflict between the two countries, which has put the American ideas of free trade at odds with China's state-led development structure. Canada has explored free trade with China in the past, but has yet to sign an agreement. And if it wants to stay in the USMCA, it may not get the chance to do so without the Americans' blessing. Foreign Affairs Minister Chrystia Freeland has insisted the clause is no big deal. In a news conference Monday, she said the non-market clause doesn't matter, because any country can walk away from the USMCA at any time with six months' notice, according to Maclean's. "Each country should have the right to make a sovereign decision about whether it wants to remain in a trade agreement," she said. "That has always been the case with NAFTA. It continues to be the case with NAFTA." Stephens called Freeland's comments "a smokescreen." "Yes of course, Canada or the U.S. or anybody could cancel the agreement for any reason. But that's a general termination clause that's in all trade agreements ... this is a very, very specific trigger." He said the federal government needs to explain how this clause is compatible with its "professed attachment to trade diversification," pointing to the recent appointment of Liberal MP Jim Carr as trade diversification minister. Stephens said it's "essential" for Canada to diversify its trading partners, and "we already have too many eggs in one basket. "If you put yourself in the position where 75 per cent of your exports go to one market, and that market decides that they're going to trot out bogus national security reasons to impose tariffs on your automobiles, your steel, your aluminum, maybe next it'll be maple syrup," he said. Clarification: A previous headline on this story used the word "veto" to describe possible U.S. influence over Canadian trade deals through Article 32.10 of the USMCA, though it is not technically a veto. We've updated the headline to avoid confusion.